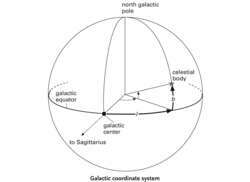 astronomical coordinate systemastronomical coordinate systems. A coordinate system is a method of indicating positions. Each coordinate is a quantity measured from some starting point along some line or curve, called a coordinate axis. ..... Click the link for more information. ) and the reference points are the north galactic pole and the zero point on the galactic equator; the coordinates of a celestial body are its galactic longitude and galactic latitude. In the IAU galactic coordinate system, introduced in 1958 by the International Astronomical Union, the zero point on the galactic equator has the equatorial coordinates R.A. 17h39.3m and Dec. −28°55'; this lies in the direction of the center of our galaxy, the Milky Way. A coordinate system used to study the structure, surroundings, and contents of the Galaxy. The fundamental circle is the galactic equator and the zero point lies in the direction of the galactic center (in the constellation Sagittarius) as seen from Earth (see illustration). The coordinates are galactic latitude and longitude. The galactic latitude (b) of a celestial body is its angular distance (from 0° to 90°) north (counted positive) or south (counted negative) of the galactic equator; it is measured along the great circle passing through the body and the galactic poles. The galactic longitude (l) of a celestial body is its angular distance (from 0° to 360°) from the nominal galactic center measured eastward along the galactic equator to the intersection of the great circle passing through the body. The position of zero galactic longitude, i.e. the nominal galactic center, was agreed (1959) by the International Astronomical Union (IAU); it lies at RA 17h 45.6m, dec –28°56′.3 (2000.0). More recent observations suggest the actual galactic center coincides with a radio and infrared souce, Sagittarius A West, a few arc minutes from this nominal position; the nominal center is still used, however, as the zero point for galactic coordinates. The true center lies at l = –3′.34, b = –2′.75. This wave-like feature -- which traces the path of the solar system as it rises above and falls below the Milky Way's plane (dark horizontal band) over nearly a year -- markes the dusty debris from relatively recent asteroid collisions, shown here in greater detail than ever before. First, at visible wavelengths it is largely hidden behind gas and dust near the Milky Way's plane. Sco X-1, they say, careens tightly around our Milky Way's core, then loops outward on a highly eccentric orbit that takes it nearly 14,000 light-years above the Milky Way's plane. Do Globular Clusters Spit Out X-ray Stars? Sankrit noted that the findings shrink the Cygnus Loop from its old diameter of 125 light-years to 80, place it 215 light-years above the Milky Way's plane instead of 360, and make it less energetic as well.